Do you know what an Okapi is? 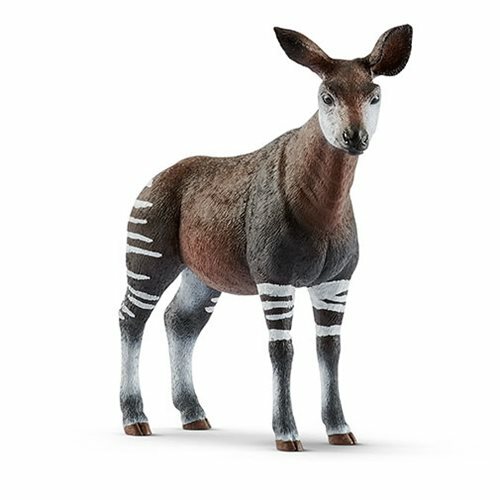 Well, it's a small forest giraffe, and you can own one (kinda) in the form of this very realistic Wild Life Okapi Collectible Figure measuring approximately 4 1/3-inches long x 4-inches tall. For even more fun, collect and play with all the finely detailed Schleich Wild Life playsets and figures. They encourage children to play and learn at the same time! Each sold separately. Particularly remarkable is the Okapi's striped fur on its hindquarters, which resembles a zebra. Okapis live in a small area in the African rainforest and eat leaves, fruits, ferns, and mushrooms. The animals are very shy and were therefore not discovered by the Western world until 1890.